Harrison Ford is an American actor and film producer. In 2015 Harrison Ford, a pilot, was in a plane crash when his vintage aircraft developed problems and he had to land on a golf course in California. He suffered a broken ankle and pelvis. He was born on July 13, 1942 in Chicago, Illinois. In 1983 while filming Indiana Jones and the Temple of Doom, Harrison Ford suffered a herniated disc. He returned to set six weeks later after surgery and recovery. His parents were Dorothy (Nidelman), a radio actress, and Christopher Ford (born John William Ford), an actor turned advertising executive. His father was of Irish and German ancestry, while his maternal grandparents were Jewish immigrants from Minsk, Belarus. Harrison Ford has a younger brother, Terence, born in 1945. In 1960, Ford graduated from Maine East High School in Park Ridge, Illinois. He had a good voice andthus was a regular speaker in his high school’s radio station. Harrison Ford has been married to Calista Flockhart since 2010. Ford attended Ripon College, Wisconsin, where he studied English and philosophy and took his first acting class. He dropped out just before graduation, and when, in 1985, the college offered him an honorary degree, he declined it. Ford went to Los Angeles in 1964 to apply for a job in radio voice-overs. He did not get it, but stayed in California and eventually signed a $150-a-week contract with Columbia Pictures’ New Talent program, playing bit roles in films. His first known role was an uncredited one as a bellhop in Dead Heat on a Merry-Go-Round (1966). He was first credited as “Harrison J. Ford” in the 1967 Western film, A Time for Killing, but the “J” did not stand for anything, since he has no middle name. It was added to avoid confusion with a silent film actor also named Harrison Ford, who died in 1957. Harrison Ford married Melissa Mathison on 1983 and had two children together. series throughout the late 1960s and early 1970s. In 2000 Harrison Ford was awarded the AFI Life Achievement Award. While kept taking minor roles, he was introduced to George Lucas, a director who would later discover his talent. Ford joined him in American Graffiti (1978), a very low budgeted movie but tremendously huge in profit. Harrison Ford was married to Mary Marquardt from 1964 until 1979, and they had two sons together. Than Francis Ford Coppola hired Ford and gave him small roles in his next two films, The Conversation (1974) and Apocalypse Now (1979); in the latter film he played an army officer named “G. Lucas”. In 1977, Ford collaborated with Lucas again for his breakthrough role as Han Solo in Star Wars. His portrayal of the brash but likable rogue in this science-fiction classic helped raise his profile in Hollywood. The film’s two sequels, The Empire Strikes Back (1980) and Return of the Jedi (1983), helped make him a star. In the latter part of the 1990s Harrison Ford starred in a few movies that were not successful but his role in Air Force One propelled him to the top again. Ford’s status as a leading actor was solidified when he starred as globe-trotting archeologist Indiana Jones in the film Raiders of the Lost Ark (1981), a collaboration between George Lucas and Steven Spielberg. By the 1990s Harrison Ford was earning $20 million a film and 15% of the box office. Ford went on to star in the prequel Indiana Jones and the Temple of Doom (1984) and the sequel Indiana Jones and the Last Crusade (1989). He returned to the role yet again for a 1993 episode of the television series The Young Indiana Jones Chronicles, and even later for the fourth film Indiana Jones and the Kingdom of the Crystal Skull (2008). Ridley Scott’s cult sci-fi classic Blade Runner (1982). Harrison Ford was cast as Indiana Jones in the Indiana Jones films - which were a huge success. Than he starred in a number of dramatic-action films: Peter Weir’s Witness (1985) and The Mosquito Coast (1986), and Roman Polanski’s Frantic (1988). He received Academy Award and Golden Globe nominations for his role as John Book in Witness (1985). Harrison Ford landed the role of Han Solo for the first three Star Wars movies, as well as the 2015 Star Wars: Episode VII - The Force Awakens. The 1990s brought Ford the role of Jack Ryan in Tom Clancy’s Patriot Games (1992) and Clear and Present Danger (1994); as well as leading roles in Alan Pakula’s Presumed Innocent (1990), and The Devil’s Own (1997); Mike Nichols’ Regarding Henry (1991); Andrew Davis’ The Fugitive (1993); Sydney Pollack’s remake of Sabrina (1995); and Wolfgang Petersen’s Air Force One (1997). Harrison Ford was a struggling actor for many years. In 1973 George Lucas cast him in American Graffiti. movies, including Six Days, Seven Nights (1998), Random Hearts (1999), K-19: The Widowmaker (2002), Hollywood Homicide (2003), Firewall (2006) and Extraordinary Measures (2010). In 2010 Harrison Ford received the Wright Brothers Memorial Trophy and in 2013 he was named 48 on the list of Flying Magazine's 51 Heroes of Aviation. In 2008, Ford enjoyed success with the release of Indiana Jones and the Kingdom of the Crystal Skull, another Lucas/Spielberg collaboration. The film received generally positive reviews and was the second highest-grossing film worldwide in 2008. In July 2011, Ford starred alongside Daniel Craig and Olivia Wilde in the science fiction Western film Cowboys & Aliens. On February 26, 2015, Alcon Entertainment announced Ford would reprise his role as Rick Deckard in Blade Runner 2049 (2017). Early on in his career a film executive told Harrison Ford he would never make it in the business. Walt Disney Studios announced that Ford is scheduled to appear in a fifth Indiana Jones film due for release in 10 July, 2020. Harrison Ford received the AFI Life Achievement Award in 2000. In 2002, he received the Cecil B. DeMille Award at the Golden Globes. In 2003, he received a star on the Hollywood Walk of Fame. In 2006, he received the Jules Verne Spirit of Nature Award for his efforts related to preservation of the planet. Harrison Ford has an estimated net worth of $210 million. In the mid-1960s Harrison Ford worked as a contract player at Columbia and then as Universal. Ford has two sons, Benjamin (born 1966) and Willard (born 1969), with his first wife, Mary Marquardt, to whom he was married from 1964 until their divorce in 1979. With his second wife, screenwriter Melissa Mathison, whom he married in March 1983 and from whom he was separated in August 2001 and eventually divorced, he has two more children, Malcolm and Georgia (born 1990). Ford began dating actress Calista Flockhart after meeting at the 2002 Golden Globes, and together they are parents to her adopted son, Liam (born 2001). The couple married in 2010. Harrison Ford lives in Los Angeles, California and Jackson, Wyoming. He owns an 800-acre (320-hectare) ranch in Jackson, Wyoming, approximately half of which he has donated as a nature reserve. Ford is a private pilot of both fixed-wing aircraft and helicopters. Harrison Ford has been nominated for an Academy Award and several Golden Globe awards. He was given the Cecil B. Demille Award in 2002. After graduating from high school in 1960 Harrison Ford studied philosophy and English and developed an interest in drama when he took a course for easy credit. On several occasions, Ford has personally provided emergency helicopter services at the request of local authorities, in one instance rescuing a hiker overcome by dehydration. Following on his success portraying the archaeologist Indiana Jones, Ford also plays a part in supporting the work of professional archaeologists. Honored for his work with the environment, Ford was asked to name a current breed of butterfly. He named this after his daughter, Georgia. While working as a carpenter, he became a stagehand for the popular rock band The Doors. Ford ranked #1 in Empire (UK) magazine’s “The Top 100 Movie Stars of All Time” list. He was chosen as People magazine’s Sexiest Man Alive (1998). At one point, he was Hollywood’s best paid actor. Harrison Ford was in a helicopter crash in 1999 while piloting over Lake Piru in California. The helicopter was damaged but Harrison and the instructor were not seriously injured. Indiana Jones was voted the second greatest screen hero of all time by the American Film Institute, just behind Gregory Peck’s Atticus Finch in To Kill a Mockingbird (1962). Han Solo was ranked at #14.
films without ever signing a contract. 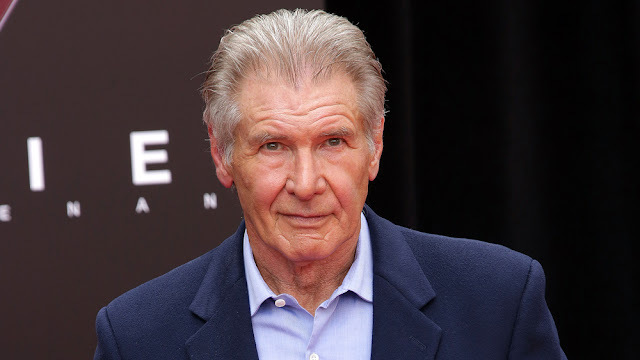 Movies that Harrison Ford is most famous for appearing in include Star Wars, Indiana Jones, Blade Runner, Patriot Games, Clear and Present Danger, Air Force One, What Lies Beneath, The Fugitive, Six Days, Seven Nights, and many more. While filming Firewall (2006) in Vancouver, British Columbia, he was so impressed with the beauty of Bowen Island that he purchased a $13-million waterfront property.